View More In Lamp Shades - Page 5. 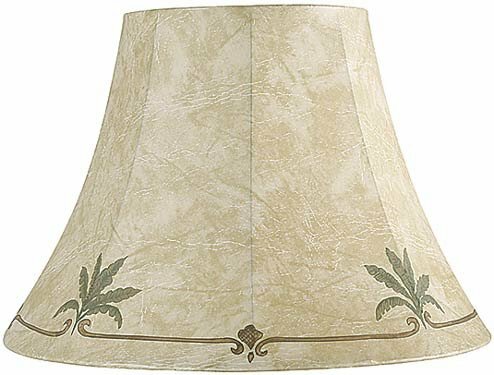 Faux leather bell shade with palm leaf design. The look is a great fit for tropical or coastal room design. This shade has a spider fitting. - 9" across the top x 18" across the bottom x 13" on the slant x 12 1/4" high overall. - Polished brass finish spider fitting. - From the Springcrest Collection™ brand. - Faux leather bell lamp shade with polyester fabric lining. 9" across the top x 18" across the bottom x 13" on the slant x 12 1/4" high overall. From the Springcrest Collection™ brand. Faux leather bell lamp shade with polyester fabric lining. If you have any questions about this product by Springcrest, contact us by completing and submitting the form below. If you are looking for a specif part number, please include it with your message.